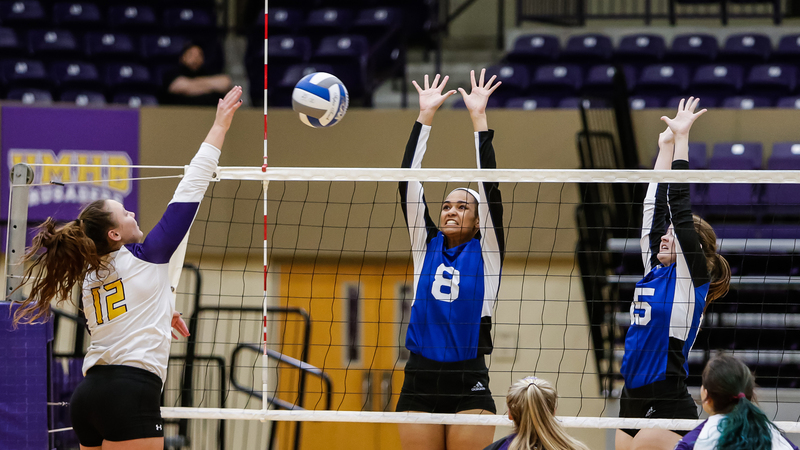 Concordia, Austin faced LeTourneau in the 2018 ASC Volleyball Championship at the Mayborn Campus Center on Thursday, November 1, 2018, in Belton, Texas. BELTON, Texas – Appearing in their first conference tournament since 1998, the LeTourneau University volleyball team would not be able to complete a late rally in the first match of the American Southwest Conference tournament falling 3-1 to Concordia Texas on Thursday, November 1. The YellowJackets finish the 2018 season with a 7-21 overall record, while the Tornados improve to 18-10 and advance to tomorrow’s quarterfinal round against Texas-Dallas. The Tornados showed no sign of postseason nerves as they jumped off to a quick start snagging the first four points of the match. LETU would be quick to respond, going on a 5-0 run of their own with Kianna Crow at the service line to claim their first lead of the match at 5-4. Holding a 14-11 lead, CTX would get back-to-back blocks to force an LETU timeout as the YellowJackets would look to recover from the five-point deficit. Unable to find their groove, LeTourneau would concede four of the final six points of the set as the Tornadoes earned a 25-16 set victory. Carrying momentum into the second set, CTX would grab an early 6-2 lead thanks in part to three blocks early on. LETU refused to back down as they went on a four-point run consisting of a pair of kills from freshman Natalie Connelly while Crow added one of her own to tie the match at 6-6. The YellowJackets would be forced to battle back from another four-point deficit later on in the set to tie and knot the game at 21-21 before claiming their first lead of the set at 23-22. LETU managed to pull away with the final two points of the set and finish the comeback to tie the match at one set each following the 25-23 victory. Old habits would catch up with LeTourneau to begin the third set as the YellowJackets would fall behind but manage to stay within three points of CTX. A second straight comeback would not be in store however as the Tornados who would prevail down the stretch with a 25-19 victory. Needing a victory in the fourth set to extend the match, the YellowJackets would once again face a deficit of as large as seven before battling back to pull within three points at 19-16. Despite the comeback midway through the set, Concordia wouldn’t let LeTourneau close the gap any more as the Tornadoes took the game 25-19 to advance to finish the match. Crow walked away just three kills shy of a new career-high, recording 19 while adding eight digs. The Tornados found blocks to be their strong point, putting down eleven attack attempts by LETU while limiting the YellowJackets to just three in the match. Other match leaders for LeTourneau were Liz Williams with digs 17 digs and Makenna Schultz with a career-high, 39 assists. LONGVIEW, Texas – After advancing 6-5 on penalty kicks on Tuesday over Sul Ross State University, the LeTourneau University women’s soccer team will make their first appearance in the American Southwest Conference Women’s Soccer Tournament Semifinals. It is when they take on number seven-nationally ranked and tournament host Hardin-Simmons University at the HSU Soccer Complex in Abilene, Texas at 5:00 pm on Friday, November 2. LETU entered the eight-team tournament as the number five seed, and managed come away with a 1-1 draw against the number four seeded Lobos before thrillingly outlasting SRSU to advance. Hardin-Simmons has won the past 15 ASC Tournaments and has participated in every single ASC Tournament held. The Cowgirls are 39-1-3 all-time in the ASC Tournament and have hosted the previous four ASC Tournaments. In their only meeting this season, HSU claimed a 4-0 victory over the YellowJackets in less than ideal conditions on September 22 in Longview. Hardin-Simmons and LeTourneau have faced off in the past two ASC Tournaments, making this the third consecutive year that LETU and HSU will play each other in postseason play. In each of the previous two meetings, the Cowgirls have won 3-0. LeTourneau has three players that have scored five or more goals this season and will be led by freshman Reagan Sandford who has the third-most points in the ASC this season with 26. HSU’s Kenne Kessler is second in the ASC with 32 points, but has scored 13 goals and is the all-time leading scorer for Hardin-Simmons with 83 career goals. Friday’s other semifinal matchup will pit the University of Texas-Dallas against the University of Mary Hardin-Baylor in a rematch of last season’s ASC Tournament semifinal matchup. The Comets and Cru are in the ASC Tournament semifinals for the fourth consecutive year after earning quarterfinals on Tuesday evening. 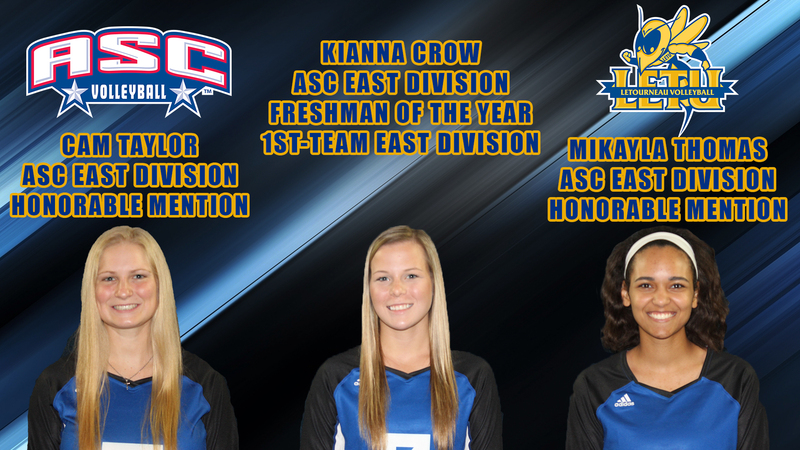 RICHARDSON, Texas – Landing three players on the American Southwest Conference All-East Division Teams, the LeTourneau University volleyball team saw Kianna Crow earn first-team All-ASC East Division and ASC East Freshman of the Year honors while Cam Taylor and Mikayla Thomas were named Honorable Mention All-ASC East Division. The three players are the most players to be named to the ASC All-Conference teams since 2013 and is the first-time that LETU has had a player named ASC East Division Freshman of the Year. Crow enter this weekend’s ASC Tournament with the most kills among any player in the ASC with 330 and is second in the conference with 3.55 kills per set. Both of these marks rank inside the top 100 among all NCAA Division III players this season as the Spring, Texas native helped lead the YellowJackets to their first ASC Tournament appearance since 1998. Taylor earns her first-ever ASC East Division Honors after leading LeTourneau with 453 set assists. For her career, the Huffman, Texas native now has 798 set assists, the sixth-most in school history. Thomas finds her way onto the All-ASC East Division Honorable Mention team for the first time in her career after having a standout junior season that saw the Kilgore, Texas native start 25 of LETU’s 27 matches and record 156 kills to go along with 41 blocks. Thomas would provide a career-high 12 kills in a four-set loss at Jarvis Christian College earlier this season and add six blocks against Concordia Texas. LeTourneau will take on Concordia Texas in the first round of the 2018 American Southwest Conference Tournament on Thursday evening at 5:00 p.m. in Belton, Texas. 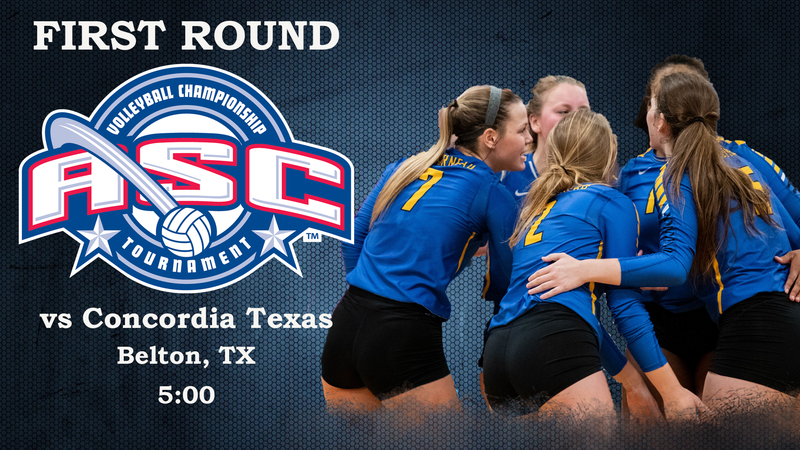 LONGVIEW, Texas – After more than a week off, the LeTourneau University volleyball team will enter this week’s American Southwest Conference Tournament for the first time since 1998 and play in a first-round matchup against Concordia University Texas at 5:00 p.m. on Thursday, November 1. The tournament, which is being hosted by the University of Mary Hardin-Baylor in Belton, Texas, features three teams from both the ASC East and West Divisions and will see the top seed from each division get a bye into Friday’s double-elimination portion of the tournament. Thursday will have two matchups with the YellowJackets and Tornadoes facing off in the first elimination match while McMurry University and East Texas Baptist will play at 8:00 p.m. in the second elimination match. Under second-year head coach Ashley Tiernan, LETU is 7-20 overall this season and will face the task of taking on a 17-10 Tornado team that went 11-4 in the ASC and won three of the last four matches of the regular-season. LeTourneau and Concordia Texas met only once this season, with CTX winning in three sets over an injury-riddled YellowJacket squad to open up the second ASC Crossover Tournament in Tyler, Texas. Led by freshman Kianna Crow, LETU will look to utilize a balanced attack that saw four different players record over 100 kills this season. With 330 kills this season, Crow ranks 96th among all NCAA Division III players and 76th in the nation with 3.55 kills per set. Concordia Texas has made the ASC Tournament semifinals in two of the past three seasons and will be led by junior Marissa Stinson who has 287 kills and 60 blocks this season. The winner of the 5:00 p.m. matchup will advance to Friday’s 11:00 a.m. against regular-season East Division winner Texas-Dallas and will play twice on Friday. In LeTourneau’s only appearance in the ASC Tournament before this year, the YellowJackets would be defeated by host Mary Hardin-Baylor in three sets (15-8, 15-4, 15-8) when only the top two schools from each division would qualify for the tournament. ROUND ROCK, Texas – Despite taking an early 1-0 lead in the seventh minute, the LeTourneau University men’s soccer season came to a close with a 4-1 defeat on the road at Concordia University Texas in the American Southwest Conference Quarterfinal round at the Round Rock Multipurpose Complex in Round Rock, Texas on Tuesday, October 30. The YellowJackets end their 2018 campaign with a 6-9-2 overall record with a sixth-place regular season finish in the ASC. With the win, the Tornados will move on to play in a semifinal matchup, improving to 10-5-1 overall. 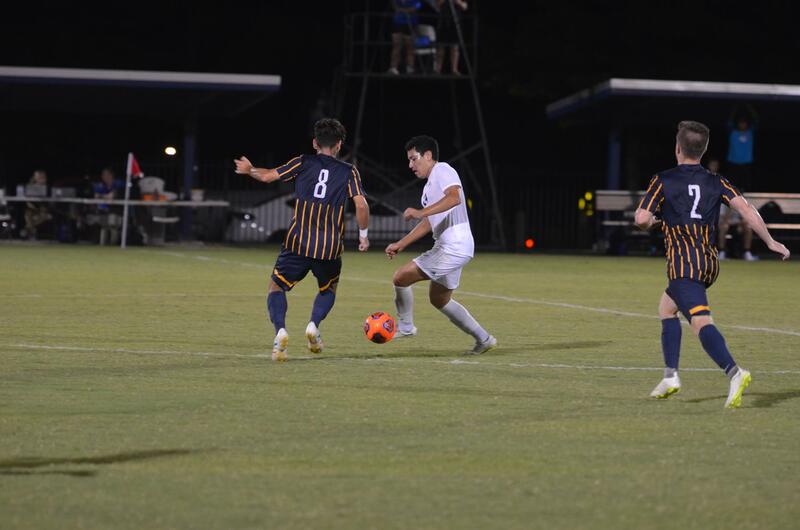 The YellowJackets made the most of their very first corner kick of the match as Luis De La Torre sent in a ball to Zachariah Malik who headed it home to put LETU on top 1-0 in the seventh minute. After several offensive threats, the Tornados were able to capitalize on a shot of their own, scoring the equalizer in the 19th minute Continuing their offensive-threat, Concordia Texas would take the lead in the 27th minute to go up 2-1 and flip momentum on LETU. The YellowJackets would see their final opportunity of the half come in the 39th minute when they were awarded a penalty kick, but see De La Torre turned away on a diving save by Tornado goalie Rob Oakley. The Tornados were quick to add to their lead in the second half as they capitalized on a breakaway in the 54th minute by Omar Aguirre who would score his third goal of the match to make the score 3-1. Five minutes, a header off a corner kick put CTX on the board again to go up 4-1 and in full control of the match. With their backs against the wall, the LeTourneau would manage to attempt only more two shots for the remainder of the game and would come up empty. The Tornados saw a 23-6 advantage in shots and a 12-5 lead in corner kicks which proved to be too much for the YellowJacket defense to try and withstand. LeTourneau goalie C.J. Leyva made nine saves in the game, while playing all 90 minutes in net. ALPINE, Texas – After just missing out on a golden goal in the second overtime, the LeTourneau University women’s soccer team made history by advancing in the American Southwest Conference Tournament on penalty kicks after finishing with a 1-1 draw at Sul Ross State University in Alpine, Texas on Tuesday, October 30. LETU is now 11-5-2 overall and will play in the first semifinal of the 2018 ASC Tournament on Friday, November 2nd against Hardin-Simmons University. Sul Ross State ends their season with an overall record 9-3-1. Both teams were playing each other for the second time this season. Neither squad would find many opportunities in the opening minutes of the game as possession would trade on and off. The YellowJackets would be awarded a corner kick in the 10th minute and manage to put a ball into the box that would give Keely Hayden a shot that would sail wide right as LeTourneau’s first opportunity of the match. SRSU would put up a shot of their own that would miss wide left in at the 16:48 mark, and would only take three more against the LETU defense in the first half. Kara Gipson would manage to send a ball into the 18-yard box in the 30th minute that would find the head of Hayden who would throw the ball across and into the back of the net as the YellowJackets would take a 1-0 lead over the Lobos. Just two minutes later with LeTourneau sensing momentum swinging in their favor, LETU earned a corner kick that would give Hayden another shot that would turn away before Gipson would hit the crossbar on a rebounded shot. Despite the missed opportunities, LETU allowed just two more shots in the final 15 minutes of the first half to hold onto their one-goal lead at intermission. The second half of the match would see the YellowJacket defense have to step up multiple times in the period while facing ten shots from Sul Ross. LeTourneau goalkeeper Mackenzie Wilbanks would stand tall in net, turning away four shots in the opening 25 minutes of the second half. Sul Ross State would earn a corner kick off a shot that would be turned away by Wilbanks in the 76th minute, and manage to put a ball right in front of the goal line that would be kicked around before being headed into the back of the net to tie the score at 1-1. The Lobos would then get a chance in the 86th minute to score a go-ahead goal but be turned away to send the game to overtime. In the first extra period, each team recorded one shot with little offensive action attempted. LeTourneau would very nearly end things in the second overtime session, putting pressure on the Lobos with a shot that would require a save from Kelly Swenson before seeing a shot from Gipson go just wide to the left. With no goal scored in the period, the match would go down as a tie and go to penalty kicks to determine who would extend their season to Friday. First up in the penalty kick shootout, LETU’s Reagan Sandford would put the YellowJackets up 1-0 after the first round by going to the lower right corner of the goal while Sul Ross would miss their first attempt. Both the YellowJackets and Lobos would make their second attempt before seeing a pair of misses in the third round put the score at 2-1 in favor of LeTourneau. 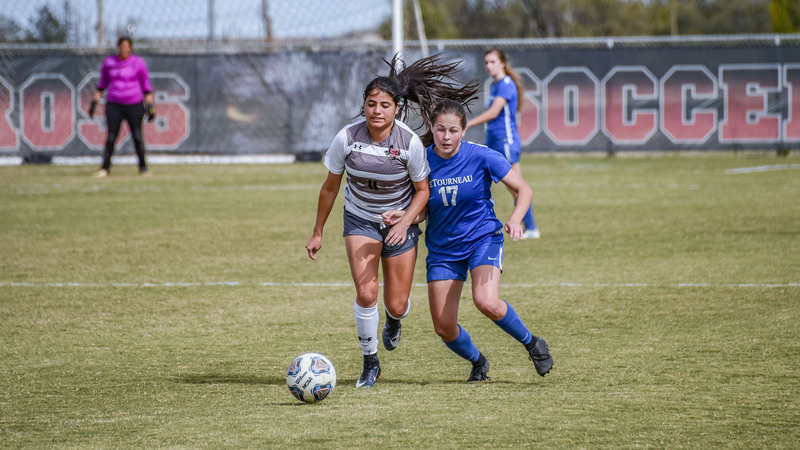 Hayden would step up and drain her penalty kick to put Sul Ross in a must-make situation, but see the Lobos keep calm and hit their penalty shot to send things to the fifth round. With a chance to win the shootout, LETU would miss and see Sul Ross send up their leading scorer Aylin Villalobos up who would send things to extra penalties after making her kick to tie the shootout at 3-3. Following two consecutive makes from each side, it would be junior Melanie Shempert who would hit her penalty kick to put LeTourneau up 6-5 and put the pressure once again back on Sul Ross. Wilbanks would make a season-extending save to turn away Victoria Shelton as the YellowJackets advanced into the semifinal round for the first time in school history. Outside of the second half that saw the Lobos with a nine-shot advantage, LETU would manage to outshoot the Lobos 10-8 in the other three periods. Sul Ross State would make the most of their shots, however, putting up ten shots on goal but saw Wilbanks make nine saves to keep the YellowJackets in the match. 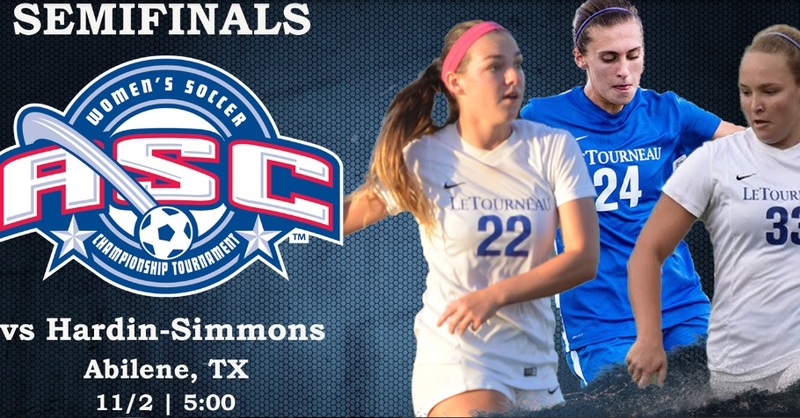 Friday’s ASC Tournament Semifinal match will take place at 5:00 on at the Hardin-Simmons University Soccer Complex. LETU will face the difficult task of taking on number seven-nationally ranked Hardin-Simmons who won their quarterfinal match 2-0 against crosstown rival McMurry University Tuesday night. The Cowgirls are 14-1-1 overall this season and have gone unbeaten in their last 15 matches.